Why does Atlas of Caregiving use maps to help family caregivers better understand their daily activities and needs? There could have been multiple formats used, so why employ cartography as the foundation to this understanding? We have always used maps. The forms and functions of maps have shifted with the times and cultures in which they are a part. At times, they function as outlets for self-expression. Sometimes they prioritize practical accuracy. Sometimes they convey power. But maps always help us make sense of something about the world around us. By tracing the trajectory of our evolving relationship with maps, perhaps we can learn something about ourselves and how we solve problems and orient ourselves in the world. The most enthusiastic cartographers may beg to differ, but ultimately, maps can be thought of as tools. Their value lies more in their applicability than in their being. The origin story of modern cartography makes this point well. While the first known maps were drawn on clay tablets nearly 3000 years ago, mapping, as we think of it today, really got its start in the second century A.D., with Claudius Ptolemy. Ptolemy was an astronomer and astrologer who invented geography almost accidentally. His true passion was astronomy, and his contributions there remain influential. In order to write better horoscopes, Ptolemy needed a system for identifying a person’s birth place on a map, so he decided to map the world. Using all the information he could find on global locations, Ptolemy carried out the first real attempt at a world map and plotted lines of longitude and latitude that would be used by cartographers for more than a thousand years after his death. Ptolemy needed to make sense of the world in order to find meaning in celestial objects. Creating a map helped him do that and also provided foundational methods and knowledge for future generations who would use maps to solve their own sets of problems. Using maps and mapping techniques to achieve goals other than navigation is a common trend in their history. Ultimately, we can see this trend impact how people make sense of the world in ways involving culture, identify, and science. In the Age of Discovery, mapping was motivated, in large part, by a desire to discover new trade routes. Mapping fueled the Age of Discovery and vice versa. As cartography (and printing technologies) advanced, maps became a commodity for wealthy citizens and contributed to changing worldviews of the time. In 1854, Dr. John Snow used a map of London to identify the cause of a cholera outbreak, tracing the spatial relationship between deaths and contaminated public water wells. Propaganda maps designed to influence the public were used to fuel wars in the twentieth-century. Contemporary researchers use principles borrowed from cartography to map the human brain in hopes of learning more about how it works in the process. By plotting the history of maps, we can trace the progress of modern development and technology. This progression also reveals stories and trends that suggest that the reasons why we create maps have not changed much. Human desires to feel oriented, knowledgeable, or in control of physical surroundings seem to have motivated historic work in mapping the world just as much as they motivate contemporary work. Take for example, the publication of Joan Blaeu’s Atlas maior in 1662. The atlas contained 4,608 pages, 594 maps, and attempted to achieve nothing less than a complete synthesis of all celestial, terrestrial, and geographic knowledge. This hardly seems any less ambitious than current attempts to map the human mind, indicating that little has changed in our reliance on maps for making sense of things, even after 500 years. By their nature, maps also remind us that finding our place in the world comes with inherent tradeoffs and admissions that we might not understand our surroundings as precisely as we would like to believe. In 1569, conception of the Mercator projection offered a way to map from the meridian lines of a sphere to the vertical lines of a flat surface and set a standard in cartography that still holds today. Since no map projection can exist without distortion, the Mercator projection has also left most of us with an incorrect conception of the actual size of some parts of the world relative to others. 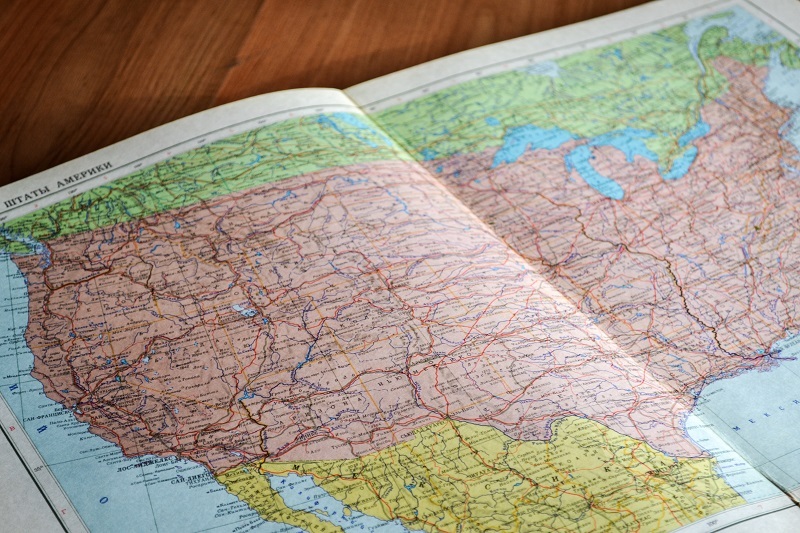 Like anything crafted by human hands, maps are prone to include mistakes. Indeed, sometimes it’s the biggest mistakes in mapping that have the most enduring impact, like Christopher Columbus’ incorrect estimation of the earth’s circumference and acceptance of other flawed geography of the time that ultimately resulted in multiple misidentifications of major landmasses or, more humorously, the nonexistent Mountains of Kong thought to exist in western Africa for 90 years. More than tools for navigation or spatial orientation, maps are the universal language for the conversation about how humans orient themselves in the world. This ongoing project underlines our everyday existence in practical and non-practical ways—from literal questions about how to get from one point to another to much broader, more philosophical examinations about how and where we fit in the world and how we should understand the world around us. Modern technology probably doesn’t change the root of the human desire to feel oriented or to understand, but it may change some of the conditions influencing how we search for answers. We’ve moved far beyond using maps merely as a means to geographic orientation. Twenty-first century maps paint pictures and tell stories with big data, visually represent millions of invisible network connections , and interact dynamically with users. Many of our maps are removed from any direct geographical component. Cognitive mapping, for example, involves creating mental representations of the relative locations of phenomena in our everyday lives and is something we all do, regardless of how aware we are of the maps our brains constructs. Cognitive mapping (and the similar behavior of mental mapping) is, of course, not a modern phenomenon. It’s a basic component of thinking. However, formalizing human behavior with maps and models is key to solving problems on all scales. Above all, maps help us visualize. They make abstract problems and solutions into visible puzzles. Looking at a simple geographic map allows us to see the problem at hand (getting from point A to point B) and then how to solve it (the best route possible given available options, terrain, etc.). Non-geographic maps do this too. Mind maps are an increasingly popular recommendation for organizing and visualizing ideas. In many ways, Atlas is developing a series of maps for making sense of life. We are working with the design firm, Accurat, to bring a digital version of the analogue CareMap to more people and communities. Significantly, Georgia Lupi, founder of Accurat, co-authored Beautiful Data, a book celebrating our ability to visualize diverse data sets in unique – and indeed, aesthetically stunning – ways. As their history shows us, using maps to visualize and solve problems is an ancient technique. Whether used to find the best sailing route around the world, or to face everyday challenges by visualizing our thoughts and looking into our own minds, maps are crucial tools for helping us make sense of the world.